On Monday, I went to Kamakura with my friend in the rain. It was hydrangeas of Meigetsuin temple that we wanted to see. Since flowers bloomed overall faster this year, it was the last minute of flowering, but we had decided to go there a month ago and had been looking forward to it. 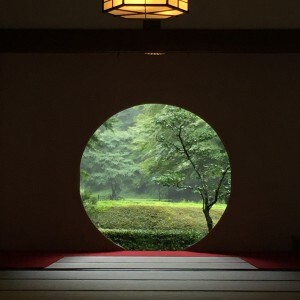 When we got off the Kita-Kamakura Station, we visited the immediate temple Engakuji first, then we went to Meigetsuin although it was raining hard occasionally. Unfortunately, we couldn’t see any flowers on the beautiful stairs of approach, but it must have been so beautiful when they were blooming. However, inside the grounds of temple, there was a part that was left slightly flowers. They said that they would cut off all of the flowers the next day. They left them for people who visited the temple, we could see the last flowers of hydrangea in this year. 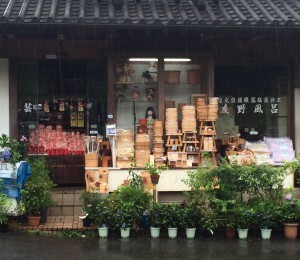 After Meigetsuin, while we were walking toward Tsuruoka-hachimangu shrine, we found an interesting shop on the other side of the street. It was a long-standing traditional house that has set a sign of ‘established the first year of Bunsei (in 1803), Tomono’s bath shop’. In the storefront, there were some items made of cypress such as basins, chairs, ladles etc. Strangely, in the store, a lot of Kewpie dalls were on display on the wagon. Bath items of sypress and Kewpies…How kitsch ! I love this. We were irresistibly drawn toward the shop. The orner was 70-year-old cypress craftsman in the eighth generation of this shop. Once he started to talk about the cypress, he couldn’t stop. Since both of us like ‘the craftsmen’, we listened to his long speach and bought the cypress oil and the egg shaped bath goods of cypress. The man also talked something about Kewpies, but I think he likes them after all. Wherever we go, we want to break soon. We found a Japanese tearoom named ‘Kasen’ and got sucked into it. When I opened the menu, the character of ‘Shiratama-zenzai (small balls made of rice powder on the sweet boiled red-beans)’ jumped into my eyes. Shiratama is my favorite. Because of the bad weather, there were no clients but us, but on the each table in the large tearoom, there was a small base with a beautiful wild flower. There was also a tatami-room in the back, the arrangement of hydrangeas placed there. 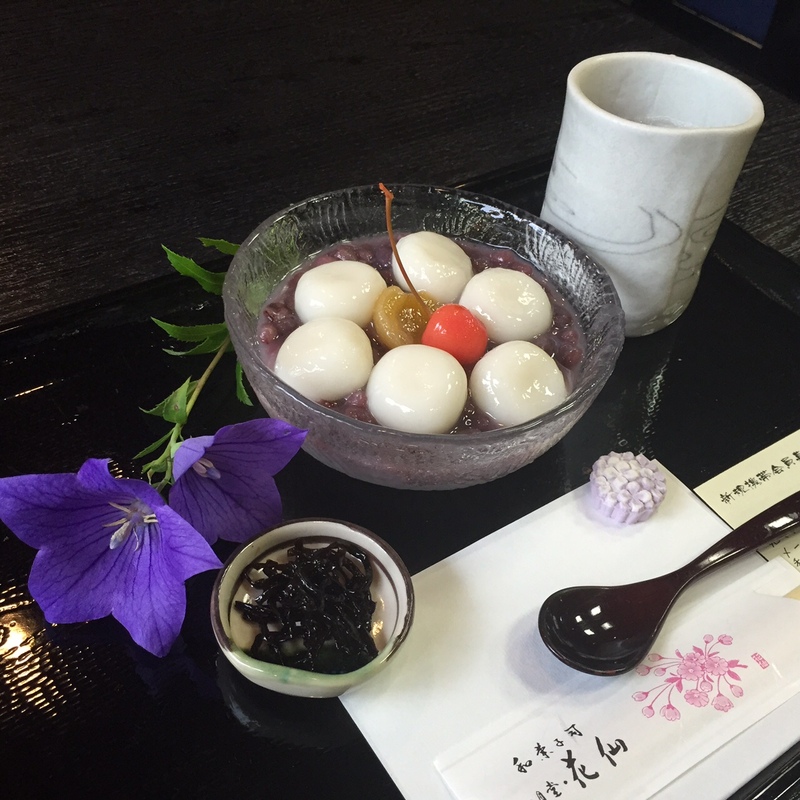 The Shiratama-zenzai had been brought. What impressed us was a sprig of Japanese bellflower placed on the plate. It was a beautiful demonstration of their thoutfullness. We enjoyed the Japanese sweets of course. Japan is still beautiful, and an interesting country.